Guitar Slash chords. Even though the name sounds violent, these chords are actually quite peaceful. A slash chord is just a guitar chord with bass note other than the root. 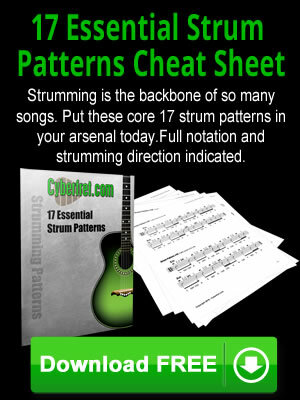 Notes on the neck or the guitar - Learn the names of the notes on every string, every fret. The way that you pronounce this chord is either "D slash F sharp" or "D with a F sharp in the bass". The letter to the left of the slash is the name of the chord, so this is a D chord. The letter you see to the right of the slash is the bass note, or lowest sounding note of the chord. Normally in a D chord the lowest sounding note is D. But in a D/F chord, the lowest sounding note is a F (F sharp).